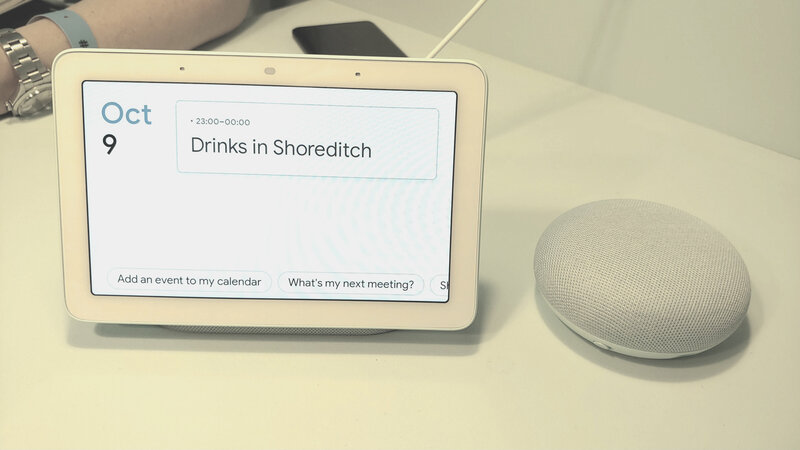 The Made By Google event may have had all eyes locked on the Google Pixel 3 smartphone, but if you were hoping for some new Google Assistant-focussed smart home news, you weren't to be disappointed either as the Google Home Hub was announced. It’s looking to take on the Amazon Echo Show 2 by bringing an integral visual element to the voice assistant speaker market. With all the power of Google search and services like YouTube and Photos built in, it’s looking like a very attractive addition to your Google-powered smart home. The Google Home Hub is up for pre-order now in the US for $149 (converted directly, that's AU$210) or £139 in the UK. It’ll be hitting retail stores in those regions on October 22, too. That’s very competitive compared to the $230/£220 Amazon Echo Show 2, especially when you consider that a 6 month subscription to YouTube Premium is thrown in for free, too, provided you sign up before the end of the year. However, note there’s no camera functionality here – so that’s a slight knock off the comparable feature list for the Google Home Hub. Want a max-sized phone perched on top of a pedestal-like speaker? You’ve got yourself the Google Home Hub. Despite press pictures that would appear to the contrary, it’s surprisingly small – tiny even – to the point where you could comfortably sit it in one hand were a mains connection not required. It’s an elegant design, with softly curved edges around the 7-inch HD touch screen, and a fabric base that puts the display on a comfortable tilt. 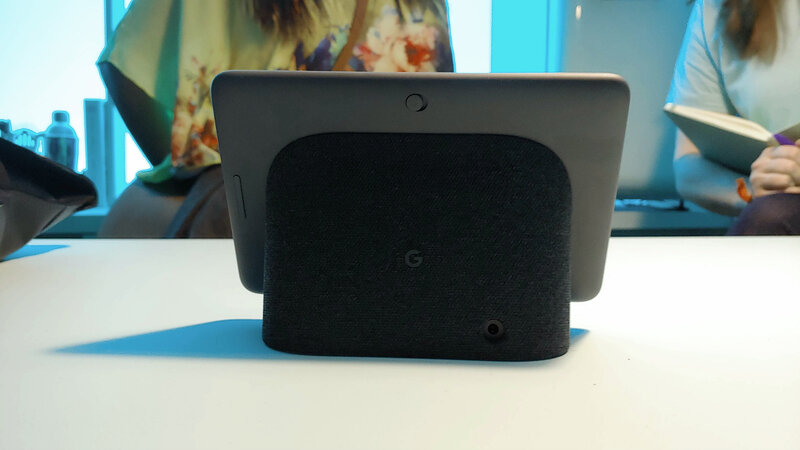 There’s a reasonably wide bezel around the screen, but that has given Google some aesthetic options to play with – pink, black, white and baby blue color options will be available, and they extend to the fabric speaker base too. Around the back you'll find a power input, volume control and mic mute toggle. You’ll note that there’s no camera inset in the bezel here either. Google claims that it’s a decision based on privacy concerns. It’s hoping you’ll have the Google Home Hub sit by your bedside as well as on your kitchen tabletop, without worrying about it recording your…ahem… more intimate moments. There’s some smart ideas in terms of the screen technology here too, making full use of the display onboard. A new ‘Ambient EQ’ feature, making use of a light sensor where you'd otherwise expect the camera to be, adjusts screen colour and brightness settings dependent on the placement of the Google Home Hub, and the surrounding conditions. So, for instance, come night time it’ll dial down the blue-light output that can cause havoc with sleep patterns, and automatically switch the screen off during late night hours when it won’t be in use. Sit it next to a window in daylight and it’ll dial that brightness way back up, just like you’d expect from a tablet or smartphone display. 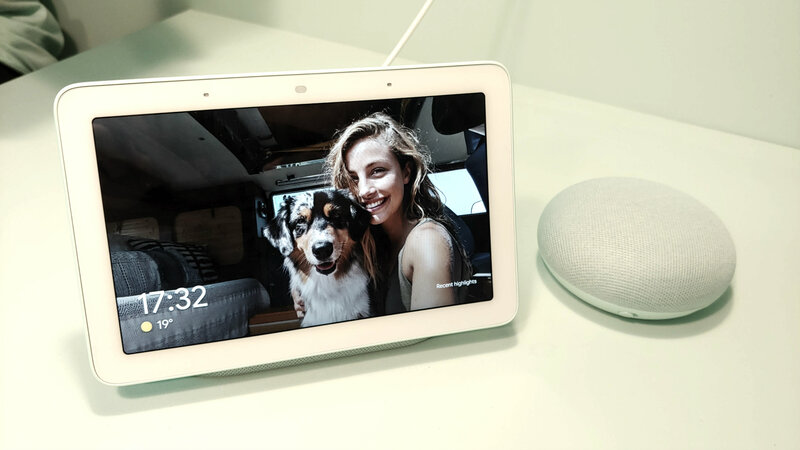 With its clever card-based visual style used across the Google ecosystem, the Google Home Hub’s screen is put to good use. If you've played around with a recent version of Android TV, for instance, you'll know what to expect here – make a search, and be presented with chunky cards full of top-line info that can be activated to present deeper details. For instance, ask the Google Home Hub for "coffee shops near me" and it'll intelligently figure out your location and display a selection of nearby stores. Tap one you like the look of, and you'll then find user reviews and photos of the establishment, while a tap on the map then brings up route information (which is far more useful in a visual state than in an audio one). And, with Google's connected services able to hook up to your individual phone thanks to voice recognition across household members, you can then ask for those directions to then be cast to your mobile device, ready to be used in-hand as you take to the streets for your journey. As you can see then, major Google services, like YouTube, Photos, Maps and Search have been optimised to provide both relevant audio feedback and visual feedback based on your voice search commands. With voice recognition picking up individual family members then (syncing up with as many as 6 different personal Google accounts) it can give personalised information in an instant. As another example, simply stating “Hey Google, good morning” at the start of your day will throw up details on your commute, the weather, agenda information and more, based on your needs. It’ll fire off this information one after the other intelligently – like a PA for your kitchen top. 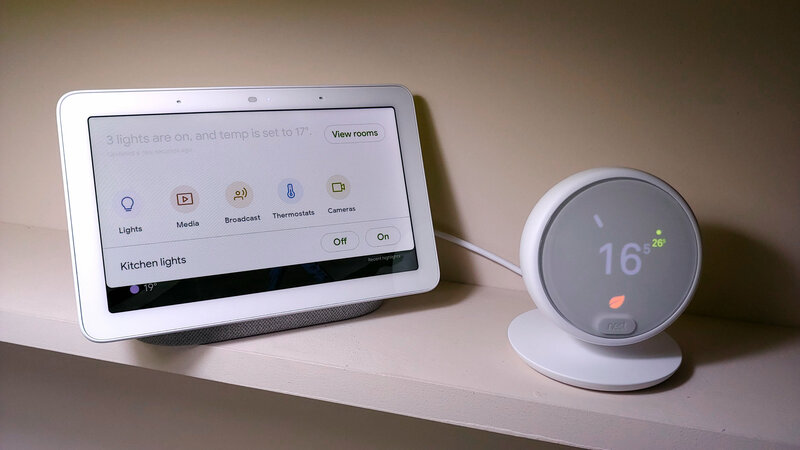 The Google Home Hub offers an intelligent approach to connected smart home devices too. Anyone that’s used a voice-only smart speaker to try to troubleshoot problematic smart home devices will know that having a mobile device on hand is a must. But the 'Home View' feature on the Home Hub, accessed like a drop-down notifications bar on a smart phone, takes some of the strain away in this respect – it shows all currently connected devices associated with your Home Hub, and, by tapping at each, gives you individual control over them. No more systematically requesting a certain light to be turned off, as a room-based overview lets you dial down on specific gadgets as required. Integration with Google-owned Nest products is particularly good in this respect. The Home Hub can answer the smart doorbell with a video feed and response options for the awaiting guest, while the thermostat can be dialled down with a visual temperature wheel from the screen itself. If there's one place where the Home Hub looks set to disappoint, it's in the audio department. Treated to a quick snippet of Dua Lipa's New Rules music video, it was hard to imagine the speaker being capable of filling anything but the smallest of rooms with music. And though the event where the unit was demoed was too noisy to make a substantial critical overview of its clarity, there seemed to be little bass or midrange to speak of. Where it does excel though is in the way it handles your Photos library. Using smart algorithms, it can pull together beautiful photo frame slideshows, and customising them to show, say, just a beach or a previously identified friend is just as easy as asking for them. 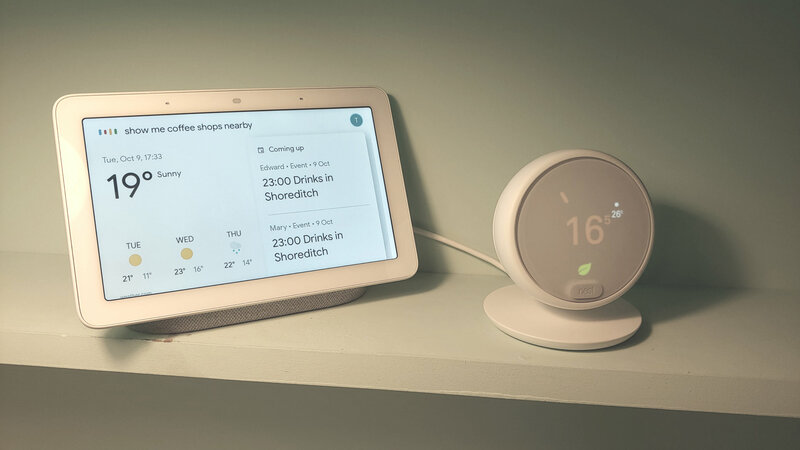 Competitively priced and intelligently designed, the Google Home Hub is well set to challenge Amazon’s Echo for a dominant place in your burgeoning smart home. Deep integration with Google services and Search makes appear set to be great at anticipating your needs, while the decision to have a one-top menu for all smart home devices associated with the Hub is a very useful one. The decision to not include a camera is an interesting one, especially as Google has its own video calling apps, like Duo, that would have fitted well here. And it’s not that hard to allow someone to disable a camera – a little bit of sticky tape would do the job. But all in, it’s a very promising smart controller. 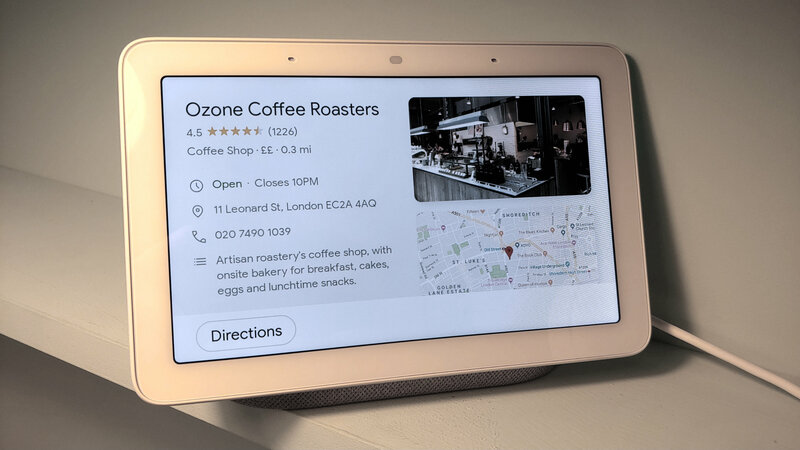 Don’t be surprised if the Google Home Hub becomes a centrepiece in many a connected home in the coming months.